Most homeowners have slowly become aware of the correlation between attic insulation at heat loss in the winter time, but many are still left wondering whether attic insulation is as important in the summer time. the answer to that question is a thousand times YES! Insufficient attic insulation can cause severe temperature variations throughout your home and can seriously affect how well you’re A/C is able to cool your home. In order to maintain your home, as a responsible homeowner, it would be very beneficial to you to fully understand the effect that attic insulation can have on your energy bills and overall home comfort levels. Below we will discuss the benefits of having a proper amount of attic insulation in the summer months, so that you can make an educated decision on what would be best for your home. Does Attic Insulation Really Block Summer Heat? In order to properly understand how attic insulation helps keep your home cool and comfortable in the summer time, it is important to understand how an insufficiently insulated attic space can make your home a sauna. Roofing materials, such as metal roofing or shingles, are known to absorb the suns heat. This heat then filters down into your attic space, causing a significant rise in temperature within. Once your attic space has become unbearably hot, the heat will begin to seep into your living space through unsealed cracks between your attic space and the interior of your home. This, of course, will increase the temperature in rooms throughout your home, forcing you’re A/C to work much harder than necessary. Without a barrier in place to stop this hot air penetration, and cool air loss, you will consistently pay far more than necessary in an attempt to maintain a comfortable household temperature. As you’re A/C is not able to work efficiently, you are not only putting a dent in your wallet, you are also contributing to the increase of residential carbon emissions. Proper amounts of attic insulation in the summertime can help to seal up your home like an envelope, keeping hot air out, and cool air in. If you are the proud owner of an older home, it is likely that your home was not designed with energy efficiency in mind. At AM Insulation Solutions, we have found that many of the older homes that we have inspected contain a plethora of air leaks, and do not contain even half of the recommended depth for attic insulation in Ontario. This is costing homeowners significantly on their cooling bills and forcing their HVAC systems to be overworked. Attic Insulation Can Maximize the Efficiency of Your HVAC System! Although our winters here in Ontario are often frigid and snowy, many of us experience hot and humid summers. We rely on the efficiency of our HVAC systems to keep us cool and comfortable through these long and hot summer days. Reduced Heat Gains: While insulation in the summer is not able to protect your roof from becoming scorched by the sun, it will ensure that the heat created does not have the ability to infiltrate your home. Keep Cool Air In: As efficient as attic insulation is in keeping hot air out, it is also designed to keep cool air in. Allowing all of that expensive energy exactly where you need it. A/C Efficiency: When you no longer have to worry about heat gain and cool air loss, your HVAC system will be able to function at peak efficiency. Keeping both your indoor temperatures and your energy bills low. Once you’ve made the decision to properly insulate your attic space, you will then need to decide on which type of attic insulation in the summer will work best for your home individual needs. It is also important to hire a reputable insulation contractor to perform these attic upgrades. First off, it is important to take the insulations R-value into account. R-value is the measurement used to determine a materials ability to resist heat transfer. The thicker the attic insulation, the higher the R-value will be. 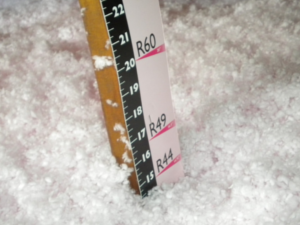 In the province of Ontario, the recommended R-value for attic insulation is R-60, which translates to 22.5 inches of insulation. Not all attic insulations are created equal however, and it is important to understand that different types, to understand how well they will work in your attic space. Fiberglass Insulation: This kind of insulation is the most common type available. It has a moderate initial R-value and can be layered to increase this number. Fiberglass is very cost-effective, and highly durable. Some forms, such as Owens Corning Pro Pink, are also water resistant, reducing the likelihood of mold and mildew development. Spray Foam: This form of attic insulation is slightly more expensive than fiberglass, though it also provides a slightly increased R-value as well. if choosing this type of attic insulation, it is important to have it installed by a trained professional as it does contain toxic materials. Spray foam should not be applied directly to damp roof boards, as rapid deterioration can occur. There are other types of attic insulation on the market, some more eco friendly than others. To ensure that you are making the right choice for your attic space, we recommend speaking with an expert to discuss your options. Though every home is different and will require a different approach to attic insulation replacement, the fact still remains, your home will function better with sufficient attic insulation in the summer months. Summers are made for lounging in the sun and enjoying the company of your family and friends. And while you will certainly be spending a significant amount of time outdoors, there will come a time where you’ll want to escape into your cool and comfortable home. To ensure that your home can remain comfortable throughout the hot summer months, hire a reputable insulation contractor to get your attic space up to current standards.